Six Important Mortgage Questions That You Need to Know Before You Purchase Your First House. Low Rates Enticing First-Time Home Buyers? Nearly one-third of home buyers are first-time home buyers, per the National Association of REALTORS®. So, with mortgage rates near four percent; and with rents rising faster than home values, it’s cheaper to buy than to rent in many U.S. markets. More than six million U.S. consumers are expected to buy a home this year. If you are planning to be among them, you will want to plan for your purchase. Six Important Mortgage Questions You Should Know Before You Buy A Home. NSH Mortgage has the knowledge to help Floridians with answering these 6 questions. Follow these steps before you start your search. 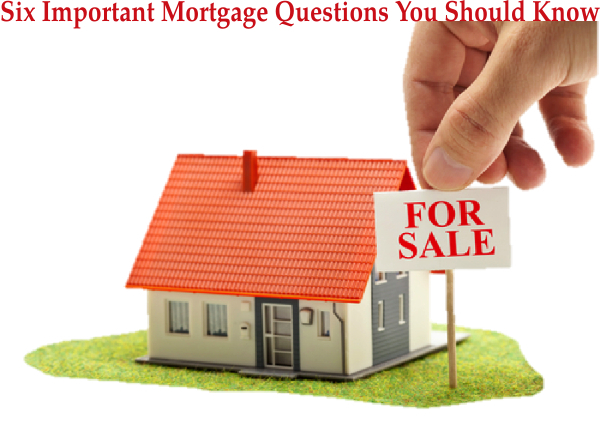 By asking good questions, you will have a firmer grasp of the home buying process and, also, of your finances. Both will help you be a better buyer. Have You Contemplated for Home Ownership? Home buyers aren’t born overnight. The choice to buy a home is one which can take day, months, or even years. There is no “right” or “wrong” timetable for it. For most people, buying a home just occurs when the time is right. Maybe you’ve outgrown your current home, or are growing your family, or are moving to a new town. Or, maybe your rental lease is ending and you’ve decided against renting for another one or two year term. Have You Considered the Costs of Home Ownership? Deciding whether to purchase a home or rent? Make your immediate finances a major factor because, although mortgage payments may be lower than comparable rental costs in many U.S. cities, the ongoing costs of home ownership are often much higher. Recall, homeowners with a mortgage are responsible for more than just the mortgage. Homeowners are also responsible for annual real estate taxes and, sometimes, annual or monthly assessments to a community. Plus, the cost of homeowners’ insurance can be higher than the cost of renters’ insurance. Few home buyers plan for these increases in costs. Additionally, homes, even new ones, require maintenance and also upkeep. A good rule of thumb is to expect annual maintenance costs to average about 1.5 percent of your home’s value. A $200,000 home thus, will likely require $3,500 in annual upkeep. This upkeep cost may include the cost of new appliances; landscaping costs; window washing and gutter cleaning; and more. Have a hold on your income, your debts and your ongoing credit obligations to make certain you are using your available money wisely. “How much home can I afford” is one of the most commonly asked questions that home buyers usually ask themselves. However, it may be the incorrect financial question to ask yourself. Instead of seeking your maximum home purchase price, it can be better to confirm the maximum monthly payment you can rationally manage, and then work backward using mortgage rates today to determine your maximum home purchasing power. A mortgage rate change of just one percentage point, for example, can raise or lower your purchasing power 11%. Similarly, real estate taxes may be lower in a developed neighborhood as compared to one which is newly-built and, association dues for a condominium can differ from building to building. When you focus on a maximum monthly payment instead of a maximum home purchase price, you can be certain that you’ve created a budget which accounts for all a home’s ongoing costs, not just its principal + interest. Have You Decided on Your Down Payment, If Any? Before acquiring a house, financial experts frequently recommend that home buyers have the six months or more of cash reserves set aside to cover living expenses, real estate taxes, and other monetary obligations if a catastrophe occurs. These funds should not be used for a home down payment. They are a cushion against emergency. And, once those funds have been set aside, home buyers should consider their home down payment. Down payments on a home can range from 0 to 20 percent or more. For buyers wishing to make the smallest down payment possible, the VA loan via the Department of Veterans Affairs also the USDA loan via the U.S. Department of Agriculture both offer no down payment loans. There are also special programs via the Federal Housing Administration (FHA) and Fannie Mae, which allows for $100 down or a similarly-low down payment. Fannie Mae and Freddie Mac offer a 97% LTV program. However, each of these programs have peculiar eligibility prerequisites. For most home buyers, the minimum down payment requested is either three percent via Fannie Mae and Freddie Mac, or 3.5 percent, available with a standard FHA loan. Are You Prepared to Pay Closing Costs? Besides a down payment, home buyers should set aside monies for home and loan closing costs, while leaving an ample portion of funds for living expenses and emergencies. The Department of Housing and Urban Development (HUD) advises that home buyers plan to have a four percent of a home’s purchase price ready at settlement to account for charges and expenses, which involve lender fees, title fees, government taxes and real estate taxes. Closing costs change by state. Some real estate contracts are composed so that the home seller refunds all, or a fraction, of the buyer’s closing costs. This is an arrangement known as Seller Concessions. Sellers may contribute toward closing costs and prepaid items up to six percent of the home’s purchase price. Your lender can also assist you to decrease your closing costs using a zero or small closing cost mortgage. If transporting cash to closing will diminish your personal reserves, have a talk with your lender about your options. Have You Examined Your Credit Report for Mistakes? For most mortgage loans, the rate you receive from the bank is linked to your personal credit score. This is because your credit score reflects the probability of your loan defaulting and your home shifting into foreclosure. Higher credit scores are linked with lower default rates. Therefore, home buyers with high credit scores get access to the lowest rates attainable, the loans then depict the least risks to the lender. However, it’s been said that as many as one-quarter of all credit report contain an error. Some of these errors are minimal and have minor results on the overall report. Yet, some are still major and can affect a score by 100 points or more. By law, U.S. consumers are permitted to receive one free copy of their credit report per year. When it is available in the home buying process you should retrieve as possible, you should execute on this right. Order your free credit report and review it for miscalculations carefully. Correct or dispute the issues you uncover.